- Director Josh Trank's sleeper hit Chronicle showcased a lot of promise for the talented young filmmaker in 2012. - Bringing in young adult-friendly actors like Miles Teller, Michael B. Jordan, Kate Mara, and Jamie Bell could help appeal to that crowd. - Tweet volume and overall Facebook fan totals are respectable. - Early reviews from major outlets are sour on the reboot, which won't help matters given the original two films aren't fondly remembered by most audiences. - In the age of frequent comic book movie successes, the standards for the genre have been raised to an even higher level than they were when the last film came out in 2007. - Recent growth in Flixster fan anticipation and Facebook likes have slowed dramatically, on top of very poor positive-to-negative ratios among Twitter mentions. - Meryl Streep certainly has a large enough following among casual audiences to attract business this weekend, ala August 2012's Hope Springs. - Recent Twitter activity has been comparable to that of last year's The Hundred-foot Journey. - Flixster and Facebook growth have come at a slower pace than Hundred-foot Journey. - Marketing has been minimal. It's possible that not even all of Streep's fans know that this is coming out. - Positive reviews are generating healthy buzz for this under-the-radar thriller. - With a fairly recognizable cast of leads, this could prove to draw out genre fans. - Twitter and Facebook movement leave a little to be desired. - Given the generally mediocre past few weeks at the box office, odds of a breakout seem low. - With Pixels missing its mark, this is the first kiddie-targeted film to open since Minions. - Parents may find some reprieve from the typical CG animated flicks with this option, which is generating strong critical reviews. - The film's overseas release has done well, but it's inflated the pic's Facebook fan total (an impressive 5.6 million). Actual recent growth is quite slow. Twitter activity is middling. - In general, stop-motion animation is hit or miss at the North American box office. 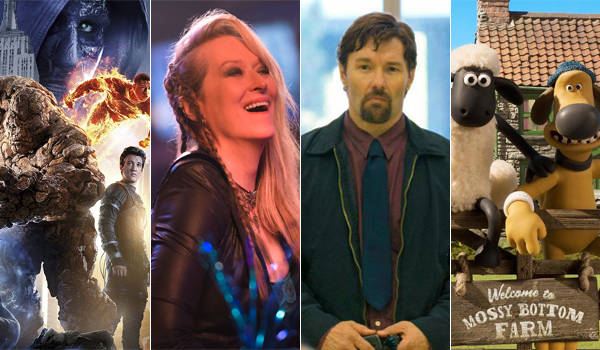 BoxOffice predicts that this weekend's top ten films will tally around $130 million. That would mark a 23 percent decline from the same frame last year, which totaled $169.7 million and was led by the excellent $65.6 million debut of Teenage Mutant Ninja Turtles and Guardians of the Galaxy's $42.1 million sophomore frame.